Properties in Wetter (Ruhr) average 4.4 out of 5 stars. 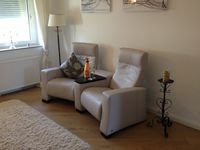 Property 9: Living dream Witten to feel good in the Ruhr area! Idyllic cottage Sweden for 3 (-4) persons with terrace and a great garden! Property 11: Idyllic cottage Sweden for 3 (-4) persons with terrace and a great garden! Welcome to your little ones out! Property 13: Welcome to your little ones out! Centrally located, modern apartment right on the city center. Property 14: Centrally located, modern apartment right on the city center. Property 31: Here you can live. Sleep peacefully and still live close to the city! Property 35: Sleep peacefully and still live close to the city! Here you are staying central yet quiet! Property 41: Here you are staying central yet quiet! We were greeted by our hosts very warmly. We arrived late because of airline issues. They were so thoughtful and understanding. When we walked into our new home away we were so happy!!! Everything you would need was there. The location of the place is in Old Bochum and it's quite, lots of space for parking, nice restaurants and grocery stores easy to walk to. We stayed almost a month and felt totally at home. Our extended family lives 10-15 minutes away and we also enjoyed hosting some special moments with our family in Bochum. Thank you Alex and Ralf for being so amazing. We loved all the artistic additions to make our home so special to enjoy. Highly recommended!!! The apartment is roomy, nicely renovated, and clean. The hosts, Julia and Hauke are so nice and even decorated for Christmas. The location is in a nice neighborhood very close to a kiosk, bakery, and grocery store. Less than 10 minute walk to the U-Bahn and S-Bahn. Having a car is not necessary if arriving by train or plane. Oh, and the bed is really comfortable.